The Alpha Road area of Surbiton around 1850 had a village atmosphere of home industries. At No 2 was John Balls, wheelwright; No 5 Mrs Ann Pratt, straw hat maker; No 6 Miss Emma Dean, lace cleaner; Mr John C Aspin owned a forge and Mr Ernest Hutchings, blacksmith, made gates and lanterns. On the Ewell Road, on the present site of Surbiton Hospital, you could have seen Surbiton Hill’s then famous landmark in the shape of the last surviving windmill, to be seen for miles around and forming part of Jenden’s Flourmill. The coaching route to Brighton and Portsmouth as late as 1862 ran along the Ewell Road and over Surbiton Hill. The intense Methodist activity in the Kingston area between 1850 and 1860 resulted in the establishment of the first Methodist Society which used the hall, ‘the Old Chapel’, the small white building still standing at No 95 Ewell Road, opposite the Hospital. 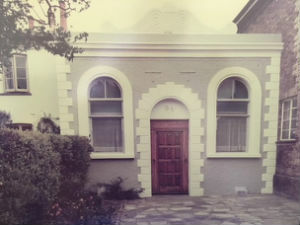 It was in this small hall built to accommodate 115 persons that the first Methodist Sunday Services were held in Surbiton. It was used until 1876 when the Iron Chapel was erected. 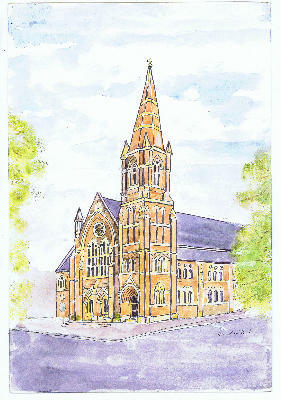 The congregation continued to grow and the Trustees decided a bigger church was required. The site of the present church, was purchased on 4th June 1873, and a Mr Charles Bell, architect, of 51 Strand, London, was appointed to design the new Chapel. In the meantime the site, then known as ‘Chapel field’, was fenced and let for grazing, and the Trustees decided to acquire a second-hand Iron Chapel, then standing on Spencer Hill, Wimbledon. The Chapel was purchased, dismantled, transported and re-erected complete with fittings and an organ for the sum of £738. 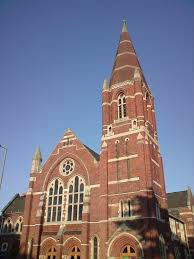 It was opened on 11th February 1876 and served the enlarged congregation of nearly 500 until 1882. Sittings were to be charged at rates of 2/6d., 2/- and 1/6d per sitting per quarter, and whole pews were let for 10/- per quarter. All around the Ewell Road stretched fields and copses, street lights being few and far between, and one of those members of the early Methodist Society attending the old Chapel, and later the Iron Chapel, recounted how, when going home from church, she ‘frequently ran along all the dark patches of the road for fear of footpads’. When the permanent Chapel was completed the Iron Chapel was sold on for what it had cost. 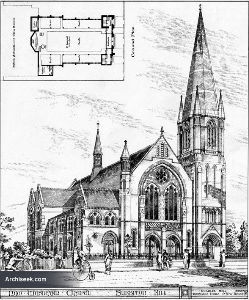 The foundation stone for the Chapel you see now was laid 5th September 1881, and the Chapel was open for worship on 11th May 1882. The land had been purchased for £1500 at a time when the class of house property in the neighbourhood was stated as ‘villas from £30 to £150’. 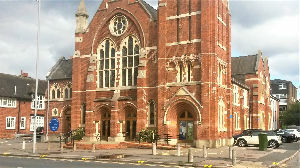 The building itself cost £5,660. When it is remembered that a leading economist writing in 1895 had said that the difference between an income of £30 a year and £150 a year represented the gap between poverty and material wellbeing, then behind the growth of the Building Fund was a level of sacrifice perhaps unknown to this generation. And so it was that the New Wesleyan Chapel came into being on Surbiton Hill. Constructed of red Leicester bricks, with Bath stone dressings, it was designed in the early Gothic Style. The main entrance was central, with two coupled doorways with angle Bath Stone columns supporting richly moulded arches. The gallery entrances were contained in the tower on one side and an annexe on the other. The vestibule gave access to the Church by double doors. The full dimensions of the building were intended to give accommodation for 1,000, but accommodation was required originally for only 660 persons, and so a screen was fixed across the Church at the eastern end of the transepts. There were galleries at the western end and sides. The roof of the Church was of open timber, supported by iron columns of special design. All the windows were of stone, filled with Cathedral glass. The interior gas lighting was by coronae from the centre of each arcade supporting the roof. 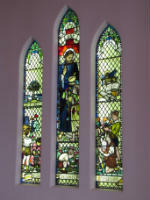 This window, was installed in 1947 in memory of Herbert Samuel Durbin, Surbiton’s first Charter Mayor and Trustee of the church for many years. (Look for the memorial tablet now located on the back wall of the Church). It was designed and executed by Maude Bishop of Kingston. The four tall chairs that grace the Sanctuary area were designed and made by Graham Laird a joiner from Ashstead and dedicated on 21st November 1999. Each carries a symbol worked in black oak veneer made from bog oak which is found in peat bogs in Lincolnshire and Ireland and can be 5,000 or even 7,000 years old. The Cross is the basic symbol of the Christian Faith. The Dove represents the Holy Spirit descending at the baptism of Jesus and is based on the drawing in the Good News Bible. The Ichthus, Greek for fish, is an ancient Christian symbol for Christ. It was used as a secret sign by the early Christians. The fourth chair carries the Greek letters Xp which are the first letters of the name of Christ being equivalent to Ch and r in English. Notice that the legs taper upwards from the ground, reflecting our stability on our firm foundation in the faith: the backs taper upwards, pointing to heaven.